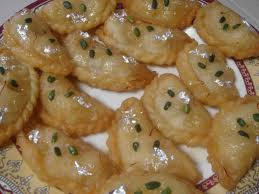 It is an Original Desi pastry with the Indian flavor. Mix the ghee with the maida and then mix it with milk. Now add some water and knead lightly into a soft but tight dough. Now mash the khoya and fry it in a kadhai / deep pan till light brown in color. Fry suji till it becomes light brown in colour. Add sugar and cardamom powder into the khoya and mix well. Fry for 2 minutes and remove from the heat. Heat oil/ghee in a kadhai and deep fry the gujiyas in batches on a medium flame..
Store for use in an airtight glass jar. Note : Gujiya moulds can also be used (they are easily available in any indian store or market). For using moulds, place the rolled dough ball in a greased gujiya mould and fill a tblsp of filling mixture on one side. Moisten the edges of the round and fold one side of the mould over the other. Remove the excess edges and reuse.